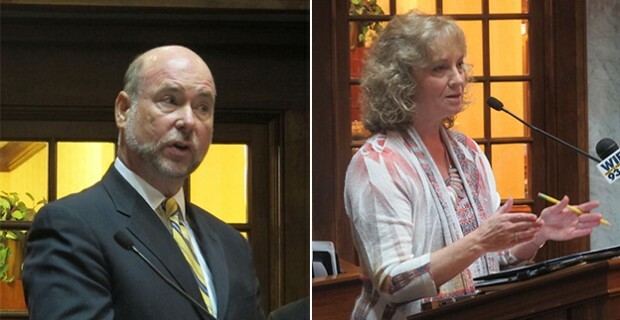 Speaker of the House Brian Bosma, left, and Superintendent of Public Instruction Glenda Ritz address the media at a press conference following the release of a report analyzing the state's A-F accountability system. Former state superintendent Tony Bennett’s staff made “plausible” changes to the state’s school rating system before releasing 2012’s A-F grades, “consistently applying” their changes to benefit not only a favorite charter school but to 180 other schools across the state, a report released Friday says. 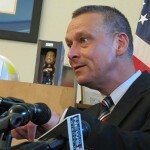 The General Assembly’s GOP leaders commissioned Indiana University’s John Grew and policy analyst Bill Sheldrake to write the report after the Associated Press released emails showing Bennett’s staff working frantically to change the formula after discovering that favorite charter, Christel House Academy, at first appeared likely to receive a C.
Grew and Sheldrake’s report echoes a finding we reported on StateImpact three weeks ago: that Christel House was one of 165 schools whose grades went up because of the last-minute tweaks Bennett’s staff made to the A-F formula. “The report clearly shows that accusations of manipulation of the A-F system for a single school are false and malicious,” Bennett wrote. But Grew and Sheldrake also say Bennett’s staff “under-estimated administrative and technical challenges” associated with implementing the new rating formula, noting “a significant portion of the educational community did not understand or trust in the accuracy or fairness” of the system Bennett implemented. Grew and Sheldrake note 165 schools’ grades were impacted by Bennett’s staff lifting what they called “subject matter growth caps” — we followed School Matters‘ Steve Hinnefeld in calling it “the subscore celing” — as part of a change that lifted Christel House’s grade. UPDATE, 2:15 p.m. EST: At a press conference following the report’s release, Speaker of the House Brian Bosma stopped short of saying whether Bennett’s staff was right to use Christel House Academy — a top performer under the state’s previous accountability system — as a benchmark for designing the new system. For his part, Bosma says he felt like the process to design an accountability system was “moving quickly” but it was former Superintendent Bennett’s decision to proceed. In the future, he says the state needs to pilot any rewrite of the A-F system before it goes live. Superintendent Glenda Ritz agrees that extensive beta testing is needed as the state re-evaluates how it grades schools. State lawmakers had already agreed to a rewrite of the A-F accountability system before the changes Bennett’s staff made became apparent. She says a new system needs to take into account schools that don’t fit neatly into the elementary/middle school or high school model. Ritz says the Department of Education worked with Grew and Sheldrake to prepare the statistical analysis within the report and agrees with those conclusions. She says there was a “flurry of activity” on the part of Bennett’s staff to address “myriad issues” but won’t speculate on the previous administration’s motivations for doing so. A newly-created panel will make recommendations for the rewrite to the State Board. It’s unlikely letter grades issued for the 2012-13 school year will count against schools facing possible state intervention. Only one school — Glenwood Leadership Academy in Evansville — would face takeover if it received an F this year. UPDATE, 12 p.m. EST: Here’s the full text of Grew and Sheldrake’s report.